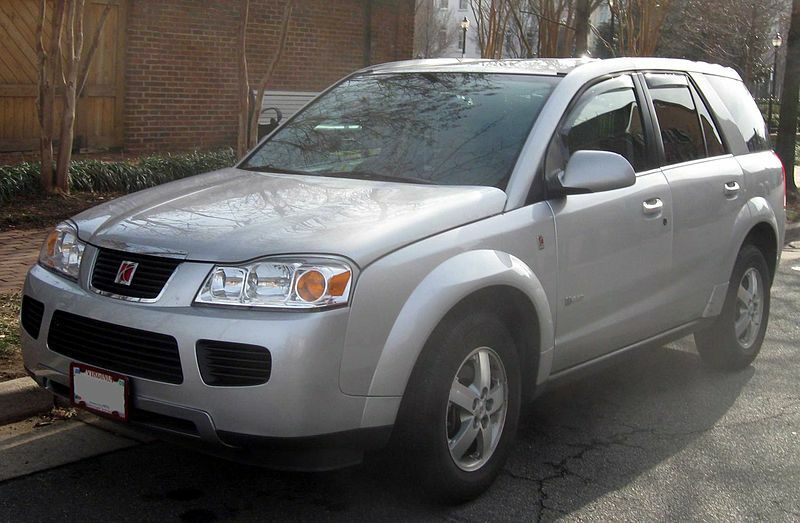 The Saturn VUE is a compact SUV that was sold and built by General Motors, and it was Saturn's best-selling model. It was the first vehicle to use the GM Theta platform when it was introduced in 2001 for the 2002 model-year. The VUE was later facelifted for the 2006 model-year. A second generation model was launched in 2007 for the 2008 model year as a rebadged Opel Antara. The VUE production in North America ended as GM wound down the Saturn brand during its 2009 reorganization. V6 models received Honda's J35A3 engine and Honda transmission. This 3.5 liter engine and 5 speed transmission boosted performance over the prior V-6. It was an important selling point at the time. This V-6 engine was used in the Saturn VUE's 2004 to 2007 model years. The fuel savings are 20 percent up from the base vehicle's 22 mpg-US (11 L/100 km)/27 mpg-US (8.7 L/100 km) city/highway EPA sticker to 27 mpg-US (8.7 L/100 km)/32 mpg-US (7.4 L/100 km), the highest highway fuel economy of any 2007 model SUV sold in the US market. In Canada, according to Saturn, the Vue gets an estimated 8.8 L/100 km (32 mpg-imp; 27 mpg-US) city and 6.7 L/100 km (42 mpg-imp; 35 mpg-US) highway. The Green Line has a 170-horsepower (130 kW) 2.4-liter Ecotec DOHC-phaser engine which replaces the standard 144-horsepower (107 kW) 2.2-liter inline-four engine, resulting in the improvement of 0–60 mph (0–97 km/h) acceleration time by 1.0 second. Pricing for the hybrid is about US$2,000 more than a similarly equipped Vue, and debuted in production form on January 8, 2006 at the North American International Auto Show in Detroit. The Green Line went on sale in the third quarter of 2006. Saturn introduced the second generation VUE in 2007 for the 2008 model year, manufactured in Mexico as a rebranded version of the German-designed Opel Antara. Saturn offered four trim levels: base "XE", classier, up-level "XR", top of the line sporty "Red Line" and a "Green Line" hybrid trim. Engines ranged from a 2.4-liter straight-four to 3.5- and 3.6-liter V6 powertrains. A hybrid powertrain version of the 2.4-liter model was also available. GM badges were now added to the front doors. 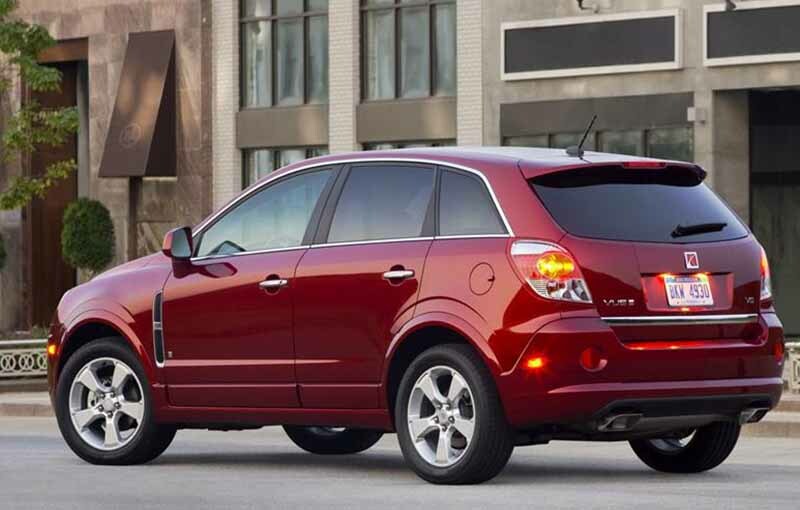 The Mexican-manufactured VUE was also retailed in Mexico and South America as the Chevrolet Captiva Sport, with only badges changed and a new grille insert fitted. 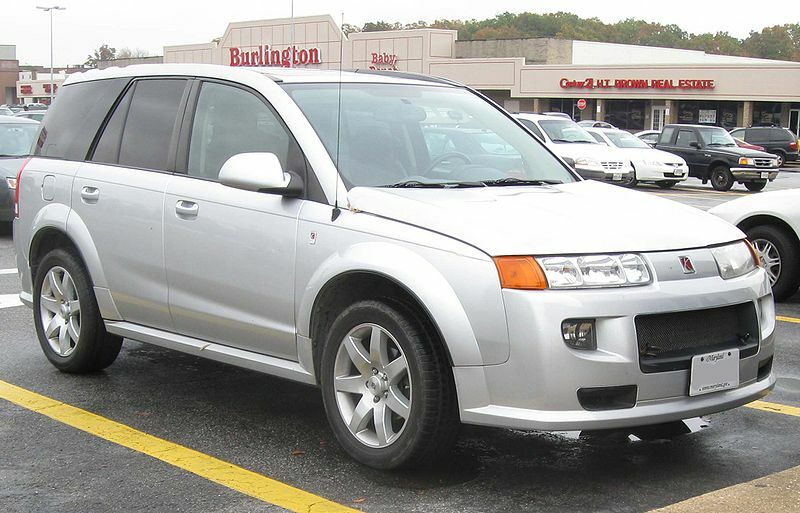 XE: The XE was the base Saturn VUE trim level. It included the following standard equipment: Sixteen-inch all-season tires, sixteen-inch aluminum alloy wheels, A/M-F/M stereo with single-disc CD player and auxiliary audio input jack, six-speaker audio system, cloth seating surfaces, keyless entry, manually-adjustable front bucket seats, aluminum interior trim, black front bumper, exterior color-keyed rear bumper, 2.4L Inline Four-Cylinder (I4) engine, and an automatic transmission. Additional options included an A/M-F/M stereo with single-disc CD/MP3 player and auxiliary audio input jack, Bluetooth for wireless phone connectivity, eight-speaker 'Saturn Advanced' premium audio system with subwoofer, a power front driver's bucket seat, remote vehicle starter system, OnStar, faux wood interior trim, and 3.6L V6 engine. 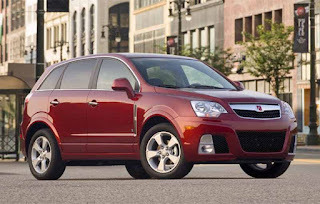 XR: The XR was the top-of-the-line Saturn VUE trim level. It included the following standard equipment, adding to the base XE trim level: Seventeen-inch all-season tires, seventeen-inch aluminum alloy wheels, A/M-F/M stereo with XM Satellite Radio, single-disc CD/MP3 player, and auxiliary audio input jack, OnStar, leather-trimmed seating surfaces, vehicle information center, power front bucket seats, faux wood interior trim, color-keyed front and rear bumpers, and 3.6L V6 engine. Additional options included a touch-screen GPS navigation system, A/M-F/M stereo with six-disc CD/MP3 changer and auxiliary audio input jack, Bluetooth for wireless phone connectivity, power sunroof, and eight-speaker 'Saturn Advanced' premium audio system with subwoofer. 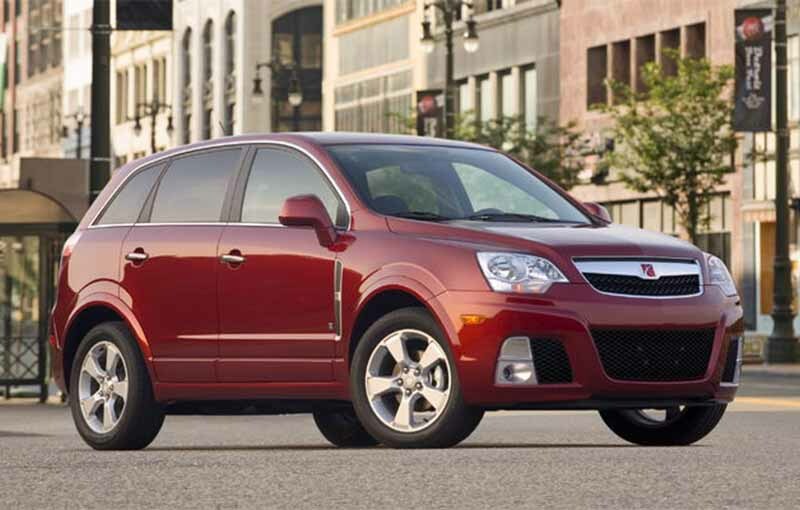 Red Line: The Red Line was the "performance-oriented" Saturn VUE trim level. It included the following standard equipment, adding to the top-of-the-line XR trim level: Eighteen-inch all-season tires, eighteen-inch aluminum alloy wheels, perforated leather-trimmed seating surfaces with microfiber inserts, remote vehicle starter system, aluminum interior trim, and red color accent stitching for seats, steering wheel, and center console lid. Additional options included a touch-screen GPS navigation system, Bluetooth for wireless phone connectivity, power sunroof, and eight-speaker 'Saturn Advanced' premium audio system with subwoofer. 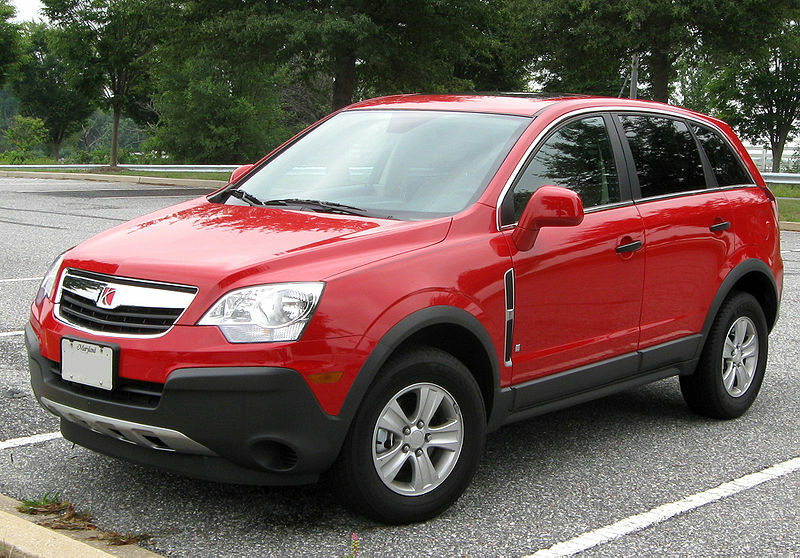 The Red Line trim level of Saturn VUE was discontinued in 2010 as the Saturn VUE ended production. Green Line or Hybrid: The Green Line was the Hybrid version of the Saturn VUE. 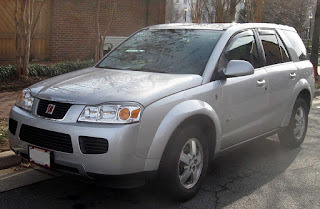 While not based on any particular Saturn VUE trim level (it was available with both the same as the XE and XR Saturn VUE trim levels), it included the following standard equipment, similar to the Saturn VUE XE trim level: Seventeen-inch all-season tires, seventeen-inch polished aluminum alloy wheels, A/M-F/M stereo with single-disc CD/MP3 player and auxiliary audio input jack, OnStar, additional chrome exterior accents, 'HYBRID' door decals (2009-2010 Hybrid models, could also be deleted), front door 'Hybrid' emblems (2009-2010 Hybrid models), a 2.4L Inline Four-Cylinder (I4) engine with electric motor, vehicle information center, and color-keyed front and rear bumpers. Additional options included leather-trimmed seating surfaces (including power front bucket seats and dual heated front bucket seats), remote vehicle starter system, A/M-F/M stereo with six-disc in-dash CD/MP3 changer and auxiliary audio input jack, a touch-screen GPS navigational radio with Hybrid information system, Bluetooth for wireless phone connectivity, deletion of the 'HYBRID' door decals, a power sunroof, XM Satellite Radio, and eight-speaker 'Saturn Advanced' premium audio system with subwoofer. In 2009, the Green Line Saturn VUE was renamed Hybrid. Last updated on 11 January 2017, at 02:51.